Long road trips don't really seem to bother Brandon Gormley. Not after where he's gone. And his next big one, to Los Angeles in June for the 2010 Entry Draft, likely will be as successful as most of the other ones he's taken. Gormley, the highly regarded Moncton Wildcats defenseman, is the top-rated QMJHL player (No. 8 overall) in NHL Central Scouting's midterm ranking of North American skaters for the draft. "He has size (6-foot-2, 187 pounds), he skates very well, he's smart and poised with the puck," Chris Bordeleau, Central Scouting's top QMJHL scout, told NHL.com. "He can feather some great passes on the tape through the middle to set up guys in the clear. He's reliable in all areas, and has confidence." That confidence is borne of a history of constant, consistent success at all levels. Last season, as a QMJHL rookie, he had 7 goals and 27 points in 62 games. This season, he has 8 goals and 37 points through 49 games. He's done a lot of his damage on the Wildcats' power play, with 10 of his 15 goals the last two seasons coming on the man-advantage. Prior to arriving in Moncton, the native of Murray River, PEI spent two years at the College of Notre Dame in Wilcox, Sask. Notre Dame hockey alums include Wendel Clark, Curtis Joseph, Rod Brind'Amour, Vincent Lecavalier and Tyler Myers, but that make leaving home at age 14 to go to school almost a continent away any easier. 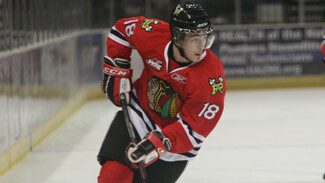 "It was definitely a tough decision when you're going to leave home at 14," Gormley told NHL.com. "It was a great decision for me looking back. It was tough for me and my family but the hockey was great there, the schooling was great there. I met an unbelievable amount of people there that were great to me. And I still keep in touch with them now." He also had a bit of help adjusting to life in the prairies. "I have a family friend who's related to us, he's related to my uncle through marriage, and they lived in Moose Jaw," said Gormley. "They were great for me. Whenever I needed to get out of Wilcox for a little while they were great to come get me. It was like having another family out there, which is good. At 14 it's hard to leave home and be on your own but it was great to have them there." Off the ice, Gormley said being away from home helped him mature faster. "It was a great experience, just growing up," he said. "It's an important time in your life. Being on your own, it does make you grow up quick. You have responsibilities that you wouldn't have at home with your parents." Gormley certainly excelled on the ice. He had 26 goals and 53 points in 42 games with Notre Dame's team in the Saskatchewan Midget AAA League in 2007-08, and the Wildcats made him the first pick of the 2008 QMJHL draft. The maturity he gained on and off the ice through the experience certainly has been noticed by those around him. "He's got a laid-back personality," Moncton coach Danny Flynn told NHL.com. "He's got the maturity of a 30 year old. Take away hockey -- he's just a rock-solid young man. "He was the first overall pick here and when he came in he was so quiet, so unassuming, so humble you couldn't tell if he was the first overall player and a player projected as a franchise player, or a free-agent walk-on who hitchhiked into camp." Gormley's skills won't overwhelm anyone, but Flynn said there isn't a thing his player doesn't do well. "He's got a number of great qualities," said Flynn. "He's got really good size, he's 6-2, headed to 6-3, and starting to fill out. … He's got outstanding hockey sense. He's got that poise, that innate ability to recognize when he has time and when he doesn't have time. For a tall, somewhat-gangly 17-year-old, he's got very good feet, very good mobility. He's not going to wow you, pull you out of your seat by going coast to coast … he plays a Nick Lidstrom style of game, he's smart and skilled and poised with the puck. The type of game he plays is similar to his. As you watch him and see how efficient he is you grow to like his game. "He's not going to be the coast to coaster like Mike Green or the physical presence like Dion Phaneuf. He's just going to be the guy who plays a smart game. You need skilled defenseman that can skate and move the puck and the transition game has become so important, and that's really where he excels. He pivots well, he gets back, he makes good reads under pressure, head-mans the puck and quarterbacks the power play." Gormley made another important trip this past summer, with Canada's entry at the Memorial of Ivan Hlinka Tournament in the Czech Republic. "That was a great experience," said Gormley, and it certainly was for him and for Canada, which took home a second straight gold medal. Gormley helped the cause with 3 goals and 5 points in five games, including a pair of goals in a 9-2 rout of Russia to clinch the gold. Flynn noticed a different approach from Gormley when he returned to Moncton. "I think when Gorms came back and saw these are the best players in the world in my age group, and I can be amongst the best players in the tournament, it make him realize the dream is becoming clearer," said Flynn. "He's got a quiet confidence and a quiet demeanor, and he knows he's got a chance, if he makes the right decisions, to be a National Hockey League player. When he got to that tournament, he saw that dream is closer and he's got a chance." The only disappointing trip Gormley has made recently was one to Saskatoon in December, where he was one of the final cuts from Canada's national junior team. "You have to respect their decisions," said Gormley. "I thought I played well in the camp. It was a great experience just to get invited to play with those players. To come in at 17 and make that team, I knew it was going to be tough. But I thought I played well and it was a great experience." There's a pretty good chance he'll skating with Team Canada in Buffalo for the 2011 World Junior Championship, but first comes the draft and his journey to the NHL. To that end, he's getting help from a PEI neighbor and fellow Notre Dame alum -- Brad Richards, who grew up in nearby Murray Harbour. "I'm a big Brad Richards fans," said Gormley. "He's been great for me, just to have that support there. Have a guy that's been through all this before, and just to see the success he's had, it's something to follow. He's always been a role model for me and all the kids in the community. He's definitely living the dream right now. Hopefully I can do the same someday." Gormley said he's gotten to skate and work out with Richards in the past when the Dallas Stars center comes home, and he's lapped up the advice from the nine-year NHL veteran. "The best thing he's given me was just basically was not to let it fly by," he said. "It goes by quick. He would know, he's been through all this before. Hockey's not going to last forever, you've got to make the best of your times now and don't wish it away and have fun with it."